“We want a trampoline!” Chances are you have been hearing that from your children and now you’re truly considering it. Have you ever wondered why in-ground trampolines are best? Did you know about in-ground trampolines when your children first started asking for a trampoline? Are there benefits to an in-ground trampoline? YES! 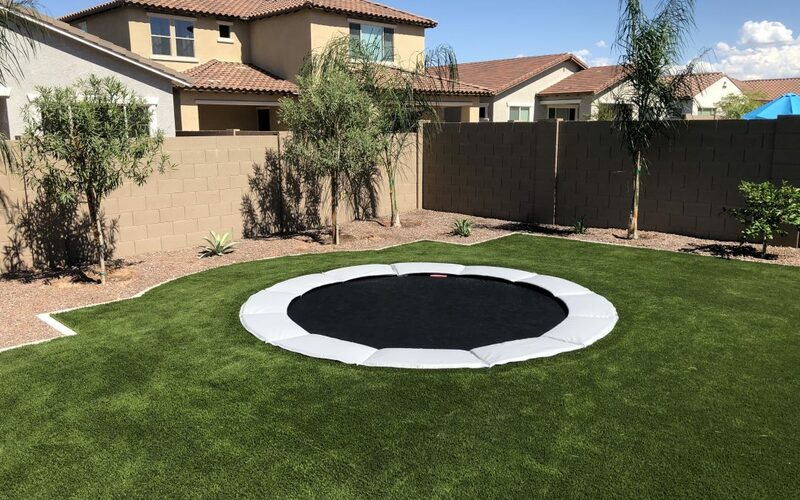 The main one is that an in-ground trampoline reduces injuries caused by “height” jumps, blends into your landscape, looks appealing in your backyard all while providing great bounce for your rebounding exercises! Safety is the most important benefit to an in-ground trampoline. The height factor of an in-ground trampoline compared to an above ground, traditional trampoline means that the distance between the ground and the rebounder is reduced. As with anything you use, injury can still occur, but a height-related injury or fall is reduced. An above ground trampoline can also injure a child or anyone who crawls beneath the trampoline while others are jumping on it — this cannot happen with an in-ground trampoline. Advanced safety in the fact that there are no metal pieces exposed on an in-ground trampoline. Your in-ground trampoline comes with a spring pad cover that protects those using the trampoline from landing on any hard metal springs and the retaining wall. The protective pad covers the lip of the in-ground trampoline up to the retaining wall and then extends a couple of additional inches to protect you even further. You can also invest in a safety net adapter kit that installs on the outside of the retaining walls to allow for a safety net enclosure to the entire in-ground trampoline. Aesthetic appeal. Above ground trampolines, let’s be honest, are unsightly in your beautifully landscaped backyard. An in-ground trampoline is an attractive alternative because the sightline in your yard isn’t obstructed by the unappealing metal frame of an above ground sytem. Your beautiful backyard and its landscaping will not be impacted by the installation of an in-ground trampline. If you’re looking at a trampoline as a way to get a healthy, fun exercise routine, then you won’t be sorry! The performance of an in-ground trampoline is the same as that you’d get from an above ground model. An in-ground trampoline is ideal for the weekend rebounder, the gymnast, cheerleader or karate expert looking to improve his or her balance and strengthen his or her core and legs. The pad of an in-ground trampoline is designed to allow for maximum airflow which makes rebounding fun and enjoyable. You get as much bounce power — if not more — with an in-ground trampoline than you’d expect! Give us a call if you have questions or are ready to make the leap (see what we did there!) into owning an in-ground trampolline.